Your child will not benefit from a helmet that is either too small or too big. You actually are greatly jeopardizing your childs safety with a bike helmet that doesn't fit properly. 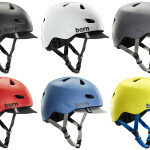 Check out this video from BERN that shows the proper way to fit a bike helmet.